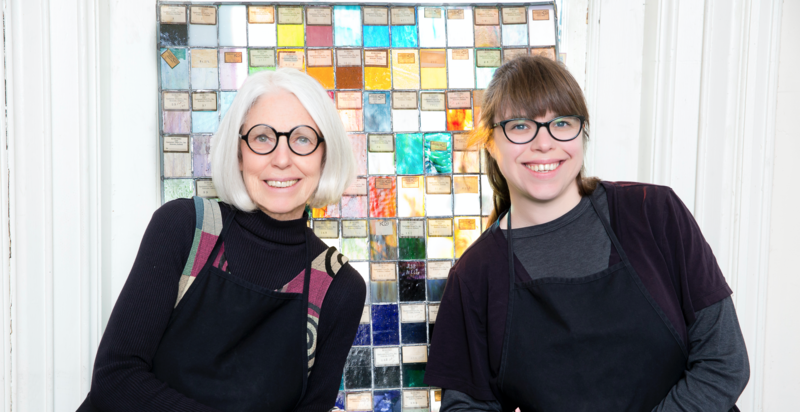 Village Glass was established in 1976, making it Columbia’s oldest continuously operating stained glass studio. Examples of our work are found throughout the city and nation. Tom Kemper and David Pickering originally established Village Glass at its first location on the second floor of the Longbell Lumber building on north Ninth Street near Ash, a spot now occupied by a parking lot. In 1978 the business was moved to 115 N. 9th Street, a storefront next door to the original location of the Candy Factory. Bennett Singleton also replaced Tom Kemper as co-owner right after the move. Wayne Brotherton purchased Village Glass Works in 1980 and operated it at 1110 Wilkes Blvd. until 1993. It was owned for a short time by Chris Viers, who relocated it to the Atkins Building at 1123 Wilkes Blvd. Tom Fiegel and Mike Koonse purchased the business in 1993 and moved it to 315 N. 10th St. in 1996. Silas Koonse recently obtained ownership of the business in December 2015, while Susie and Molly Fiegel continue to manage the day-to-day business. Village Glass and Koonse Glass are currently located at 4153 Paris Rd.